Jonathon wanted to show energy and humanity emerging through technology, symbolized by his face breaking through a circuit board. 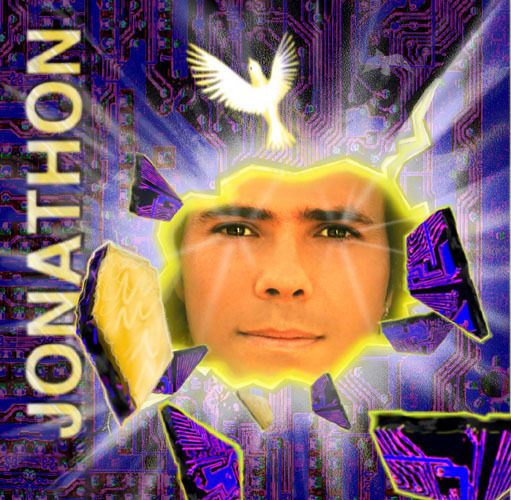 Using light to represent energy, I attempted to transmute the intensity of Jonathon's music into visual form. To create this piece, I photographed Jonathon and scanned a circuit board. In Fractal Design's Painter, I colorized, matted and airbrushed the image, using layers to genrate depth. 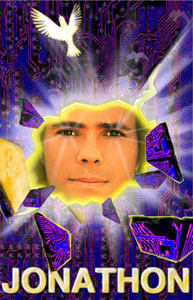 The source file for this image is 27 layers deep and over 60 megabytes. 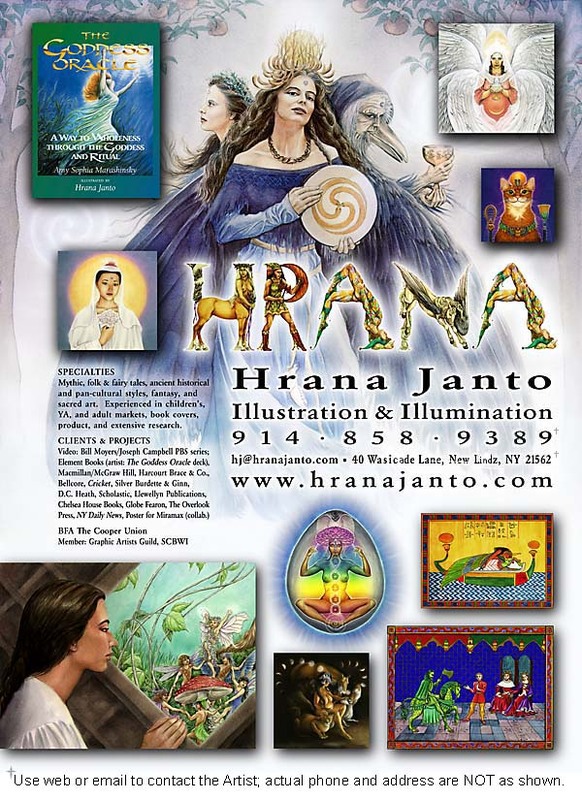 This full page color advertisement was designed by Sound Visions for artist Hrana Janto. 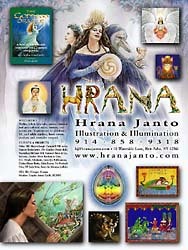 This ad appears in the 1999 Serbin Guide to Illustrators, #15 (pg. 549). Samples available. Sound Visions worked closely with the artist, generated several possible page layouts, then finished the proofed design within one week from sketch approval. Ideally, a Logotype provides striking, unique, iconography and brand recognition for your company and products. These are examples of Logo designs by Sound Visions. With twenty years experience with traditional photography (the "analog realm"), I'm very happy that Adobe Photoshop allows me even more freedom and creativity in the digital universe. 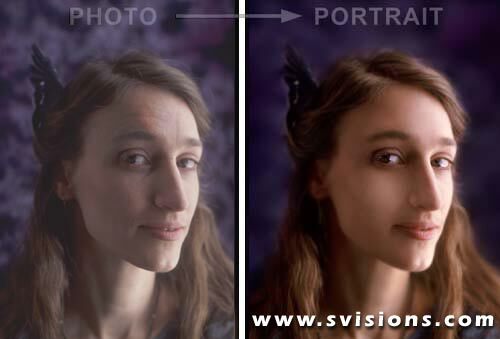 This subtle piece shows a transformation from an ordinary photograph into an elegant portrait (you will need 16-bit or 24-bit color depth to see the nuances here). Basically, I've corrected the color balance, changed the lighting, smoothed, airbrushed, highlighted and repainted, all in a photographic style. Seeing is no longer believing. Bill Gate's head on Cindy Crawford's body? Egads! What do YOU want to see? I've done a lot of graphics for a local non-profit dance collective called Dance New England, including the Dance Friday Logo and graphics for the DNE Website. These graphics are tailored to suit their intended purposes; simple linework for signs, mastheads and spot art for newsletters, photos and illustrations for flyers, and, of course web graphics. Here are two video box designs for Bridge to the TangoVideo productions, for a line of instructional videos about learning to dance the Argentine Tango. 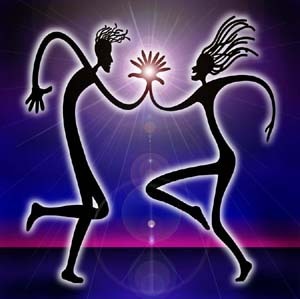 Each cover is specific to a unique video series produce by Daniel Trenner for Bridge to the Tango, constituting over 40 videos in all. Technical graphics range from very simple to complex. This diagram shows laser light reflecting down the core of a fiber optic cable. Such glass fibers form the backbone of modern high-speed data networks. Make a long-distance call, and one of these beams of light is carrying your digitized voice. This is a cross-section view of an "ST" style fiber-optic coupler, the type most used in the 250 miles of fiber-optic cabling at The MIT Media Laboratory. This is one of many illustrations used in the Lab's WWW-based online manual and Network Computing Systems resource intranet site. Cabling, managing, and effectively utilizing 4500 optical network fibers is no simple task. For maximum flexibility, the connectivity is organized in a 'level of abstraction' scheme, with Master, Intermediate and Local Distribution Frames where dyanamic interconnections can be made. These frames are called MDF, IDF and LDF, respectively. In this diagram, you can see that most network nodes (black disk = networked computer) are attached to concentrators in their Local Distribution Frames, while a few connect directly, through jumpers in their LDF and IDF, to special network hardware in the main hub, the MDF. This allows flexible support of different protocols--Ethernet, FDDI, ATM--over the same basic array of fiber connections from any room in the entire Laboratory. See also: Media Lab Network doc; Tech graphics for NVS Inc.